Let’s get real for a second. The milk that’s left in the bowl after you eat the cereal is the best part. I mean, right? No matter how delicious your favorite cereal is, it’s the cereal milk you drink when no one is looking that’s the tastiest. That’s why Momofuku invented Cereal Milk Ice Cream at their Milk Bar. 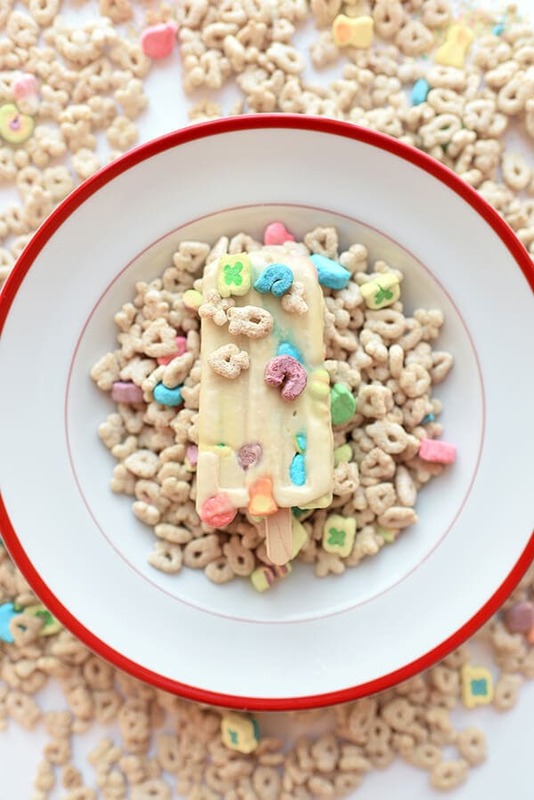 And that’s why I made these Cereal Milk Ice Cream Popsicles! Now, I gotta be honest, some cereals are healthy. These Cereal Milk Popsicles… not so much. They’re ice cream. But, I also totally had one for breakfast the other day. And by the other day, I mean yesterday. So. When I was a kid, I had no idea cereal milk was so delicious. Because I refused, like flat-out refused, to put milk in my cereal. I can’t stand soggy things (that hasn’t changed) so no way was milk touching my perfectly crunchy cereal. 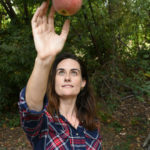 It’s the same reason I generally eat my oatmeal with as little water as possible and eschewed affogato (ice cream drenched in coffee) until I learned better. But one day I decided to try pouring A VERY LITTLE bit of milk on top of my Peanut Butter Cap’n Crunch. And, you know, what, it was pretty good. But then, I drank the cereal milk left over, and oh my god. This is why people put milk in cereal. And then I went off to watch Beetlejuice or Thundercats or Freakazoid. No wonder why everyone who’s had it loves Momofuku Milk Bar’s Cereal Milk Ice Cream. It’s rich, creamy, and totally nostalgic. And that’s why I made these Cereal Milk Ice Cream Popsicles. 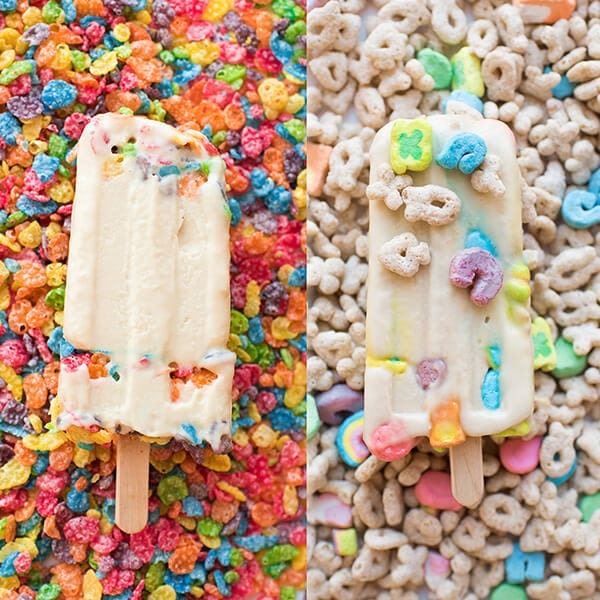 To make the best cereal milk ice cream popsicles, you have to do a little more than pour cereal milk into popsicle molds. I tried that. It was pretty tasty, but this — which requires a little more patience and is adapted from Momofuku Milk Bar’s Cereal Milk Ice Cream recipe — is better. The extra time is totally worth it. The first thing you’ll want to do is pick up a box of your favorite cereal! Do you want to make Cinnamon Toast Crunch Ice Cream? Or Honey Nut Cheerios Ice Cream? 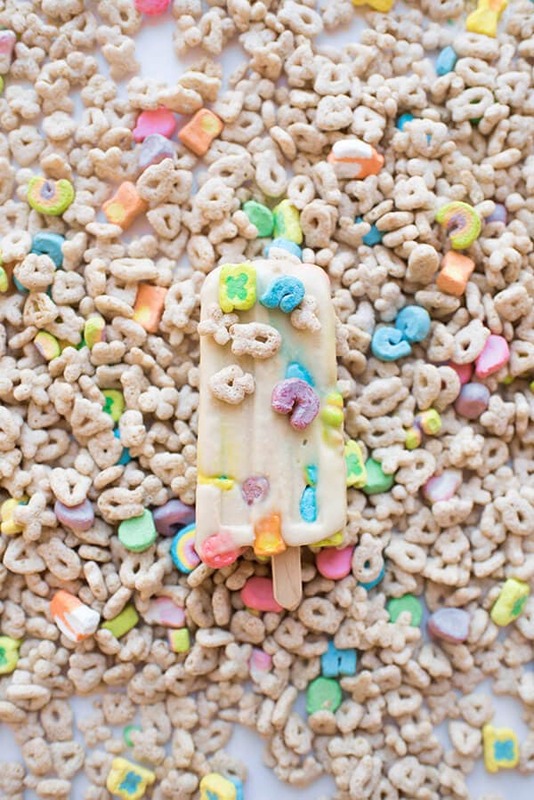 Or Lucky Charms Ice Cream? The choice is totally up to you. Now, pour 4 cups of that cereal into a bowl, top it with 3 cups of milk, and put it in the fridge for at least four hours. I popped mine in the fridge before work and made the ice cream custard when I got home later that night. Next, use a mesh strainer and strain the mixture into a bowl so you’re left with just cereal milk. Pour 2.5 cups of the cereal milk into a medium saucepan. Add heavy cream, sugar, salt, and vanilla. Separate four egg yolks and place them in a separate medium-sized bowl. (Save the egg whites to make meringues or macarons.) Stir the milk mixture on medium-low with a wooden spoon or spatula until all the sugar is dissolved and the mixture becomes a little thicker. Then, slowly, very slowly, pour a little bit — about 1/4 cup at a time — pour the hot milk mixture into the egg mixture, whisking or stirring the egg mixture simultaneously. The way I do this is I have the saucepan in my left hand and a spatula in my right. As I pour slowly from the saucepan with my left hand, I stir the eggs with my right hand. The idea here is you want to slowly bring up the temperature of the eggs without cooking them. Next, pour the mixture into a bowl, straining if necessary, and put it in the fridge for a few hours to cool down. 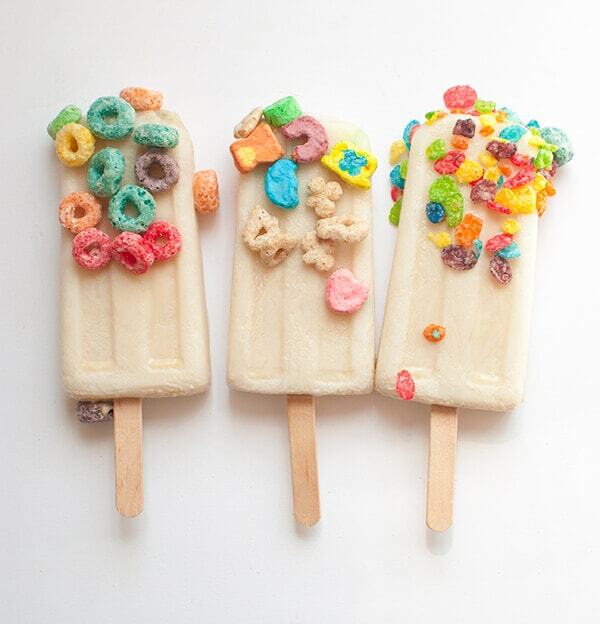 Once cool, pour it into popsicle molds, layering with more of your favorite cereal as you go. Don’t be shy with the cereal. Then add your popsicle sticks and you’re ready to go! 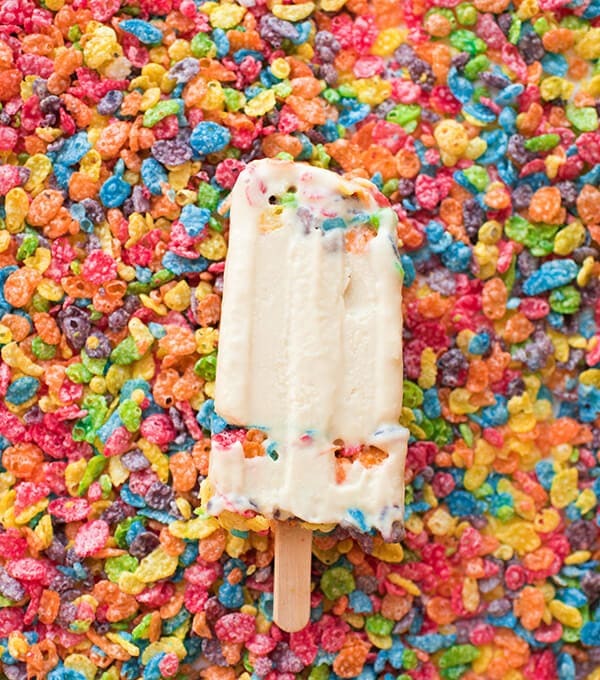 Freeze until the mixture is solid, then enjoy your Cereal Milk Ice Cream Popsicles! Enjoy breakfast for dessert with these rich, creamy, Cereal Milk Ice Cream Popsicles! Pour 4 cups of cereal and milk in a bowl. Place in fridge for at least 4 hours. Strain cereal milk mixture into bowl. Place egg yolks in separate medium-sized bowl. Pour heavy cream, sugar, salt, vanilla, and 2.5 cups cereal milk into medium saucepan. Heat on medium-low, stirring continuously with a wooden spoon, until sugar has dissolved and mixture has thickened slightly. Slowly pour milk mixture - about 1/4 cup at a time - on top of eggs, stirring continuously, until egg mixture and milk mixture are the same temperature. Pour egg mixture into saucepan. Heat on medium-low, stirring continuously, until mixture has thickened enough to coat the back of a spoon. Remove from heat, pour into bowl and let cool in fridge. 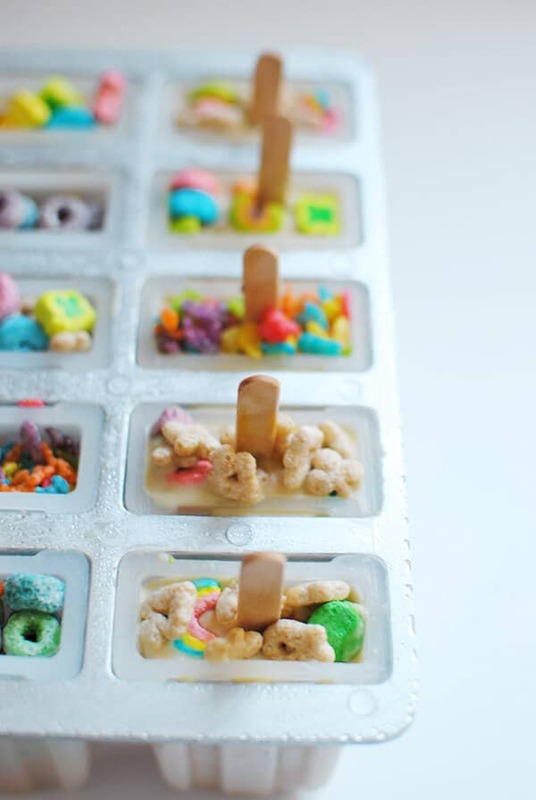 Once cool, pour into popsicle molds, layering with cereal. Let freeze. This is such a great idea. Never heard of affogato, sounds amazing! Great idea, your pops look delicious! How cute! My kids would love these. Such a fun recipe for summer.